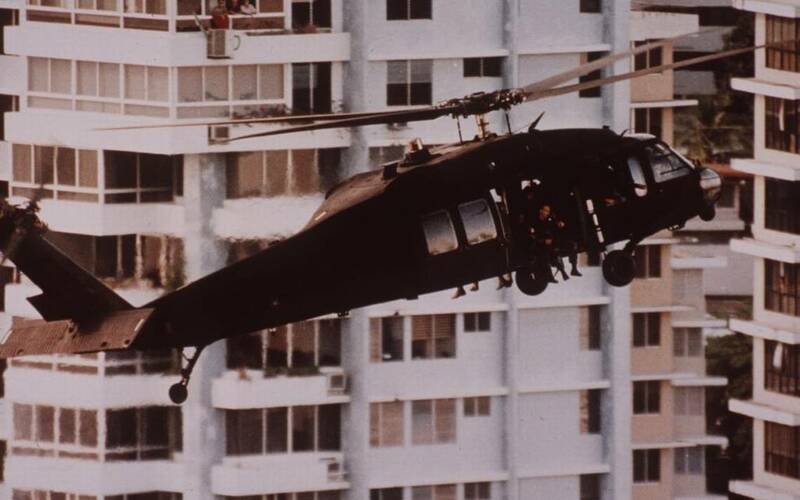 An army helicopter ferries reinforcements to the Vatican embassy in Panama City, where Gen. Manuel Noriega has taken refuge, Panama, December 21, 1989. (David Walters/Miami Herald). It was on Wednesday, December 20, 1989 was the true beginning of the post-Cold War world, American style. It was on this date twenty-eight years ago that President George H. W. Bush sent in 20,000 soldiers and sailors to end Manuel Noriega’ dictatorial rule over Panama. It remains a date from which any student of history can infer as the beginning of blatant American aggressions abroad and increasingly craven governmental behaviors at home. At least without the counterweight of the Soviet Union to keep the US from running totally amok. That week was part of my holiday semester break during my junior year at Pitt. I’d only been back in Mount Vernon and 616 for three full days, yet I was once again fully engrossed in my role as eldest child (in responsibility, if not in age). I was washing dishes post-breakfast that Wednesday morning between 11 am and 12 noon, as the national news of that day preempted The Price Is Right. It was no accident that within two months of the end of communist rule across most of Eastern Europe that the US hatches it first invasion of another nation. At least, that’s the thought I had in my head just before I cut the skin in between my middle finger and my ring finger on my right hand. This as I scrubbed out a glass that apparently had a chip around its rim. I bled profusely for a good ten minutes afterward, all while watching Dan Rather and company dig deep for analysis of what was happening in Panama and why. It wasn’t even as complex as covering my second-level cut with a band-aid (which we didn’t have at 616). Noriega had become increasingly erratic and more difficult for Bush the puppet-master to control. It wasn’t as if his dictatorship and his running drugs through Panama had been any concern of either Bush or Reagan in the eight years before the invasion. Drug trafficking and dictatorial crimes would be the excuses the Bush Administration would make for Operation Just Cause, an invasion that took 650 lives (150 or so Panamanian soldiers and more than 500 civilians), including 23 Americans. But it was essentially President Bush’s personal use of military forces to take down an asset that was the real reason for this incursion. Noriega was a man who Bush and other CIA officials had been using for the benefit of US interests in the Panama Canal and in Central America for nearly two decades. See? Much simpler than any justification over drugs and human rights violations Bush and Cheney (then Secretary of Defense) could muster. 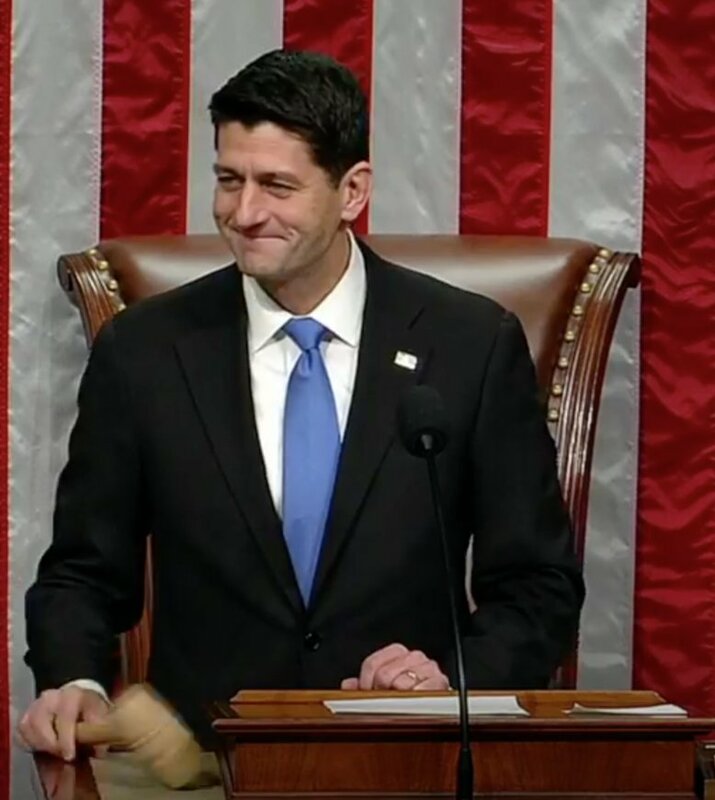 Rep. Paul Ryan (R-WI) gaveling in ecstacy as House passed its $1.45-trillion tax cut bill, December 19, 2017 (http://twitter.com). Both the UN and the European Parliament condemned the action. It didn’t matter. A year later, the US was part of the largest coalition of forces assembled since the end of World War II, this time to kick another former US asset in Saddam Hussein out of Kuwait. That Hussein invaded Kuwait after getting mixed signals from the Bush Administration is pretty well documented. That Hussein would no longer wear the leash the former head of the CIA had put on him was the ultimate cause for an counter-invasion that ultimately has destabilized the Middle East over the past three decades. This week, Congress is doing for the US what the US has done to countries and regions with increasing levels of brazen and calloused bigotry since 1989 (and in cases like Batista and Cuba, Pinochet and Chile, far longer than 30 years). What’s another trillion dollars between friends, especially friends who can donate to your congressional campaign or stash hundreds of billions of dollars off-shore? Who can Americans count on to stop this ride of greed-possessed, craven people who believe that the only Americans who count are the one’s who count suitcases full of cash to go asleep at night? Americans can’t invade themselves, after all. Of course, Americans can resist, elect more Democratic candidates, yada, yada. But dear world, we need your help, because America’s leaders are doing their level best to decay the US from within.